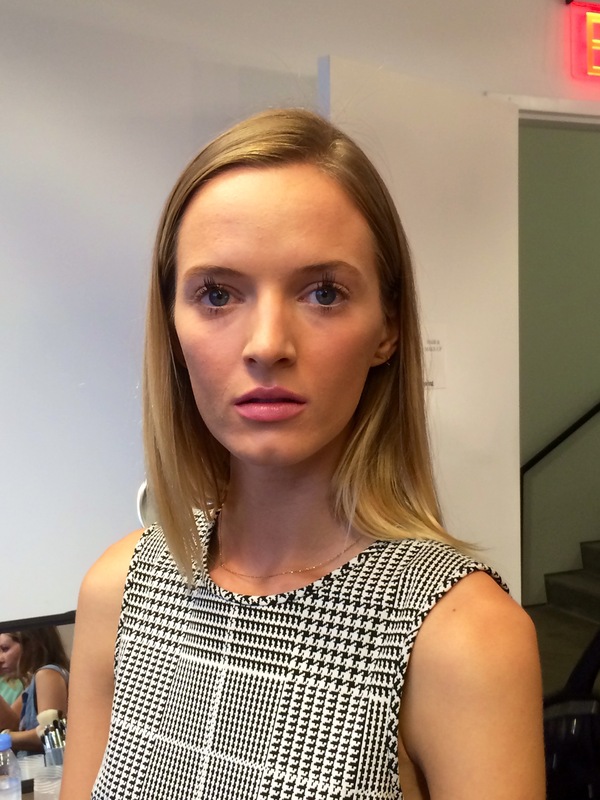 We are seriously loving the look we saw backstage at Altuzarra’s spring 2015 show last night. With intriguing lashes and heart-shaped chignons, we couldn’t wait to share the beauty look that accompanied Joseph Altuzarra’s casually cool collection. While we may not be sporting this look to the office or even girls night anytime soon, we thought we’d still share the creative doings that made this look so adorably unique. For the eyes, Pecheux wanted them to be youthfully big. He started with a “girly-pink” on the lids before moving to the lashes. He used full length lashes and cut them in the middle and placed them in the center of the top lid. “The lashes are giving a touch of candy, cartoon feel. Although lashes usually are a get-glamorous look, I like to twist things.” He then put mascara on in the center of the bottom lash and a touch of white pencil on the lash line. For the eyebrows, he simply drew a line inside the eyebrow and smudged it for a Barbie “drawn-on” type brow. To top off the doll look, Pecheux did rosy-pink big cheeks all over – not just apple of the cheeks big– and then created big full lips by drawing over the lip line and placing a creamy pink inside. And voila, you have your cool, twisted, proper Barbie doll makeup! For the hair, hairstylist Odile Gilbert for Kerastase created a Catherine Deneuve in “Belle De Jour” inspired chignon. This resulted in a uniquely adorable heart-shaped chignon. She started by pulling the hair back tightly against the scalp using Kerastase Mousse Bouffante and their new Keratine Thermique thermo-seal. To hide the elastic, she took a small piece of hair, wrapped it around the pony and secured with a bobby pin. Then she put the the ponytail-gathered hair (with the added extensions if necessary) into a color correct hairnet. Once it was all gathered in, she rolled it up underneath into the chignon, pulled up either side to shape as a heart and secured with bobby pins. To make sure it stayed, she used strong hold Kerastase Laque Noire hairspray. What do you think of this doll-inspired look? Let us know in the comments below!